This recipe for Beef Barley Vegetable soup is a cinch to put together if you have leftover roast, but if not, go ahead and cook some up fresh. In a large stock pot or Dutch oven, heat the oil over medium-low heat. Add the onions, carrot and celery along with a pinch of salt, cover the pot and allow the vegetables to sweat for 5 - 10 minutes over fairly low heat. 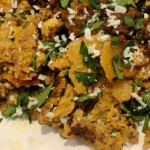 Increase heat to medium and add the flour, cook, stirring for about 5 minutes, or until the raw flour flavor is gone. Add the broth, stir well, add the gravy, water and tomatoes, stir well. Stir in the meat, potatoes, and cooked barley, along with the herbs; cover and simmer, uncovered, for 15 - 20 minutes; add the peas and corn (and green beans if using); stir and simmer for 20 minutes more, or until everything is tender. Taste and adjust for salt and pepper. Serve in deep warmed bowls. So we finally went on a vacation. A true and for real vacation. No work, no business dinners (well, in Puerto Rica we kind of had those, but not really). Yes, I got BB to actually take 2 weeks off in a row – the first time in about 3 years – and by week 2, I think I can safely say, he got relaxed as we toured our way through the Caribbean and Key West to enjoy the sun, sand, and surf. I can tell you it was a bit of a shock to come home from our 85º days / 82º nights to our current 62º days and 32º nights. 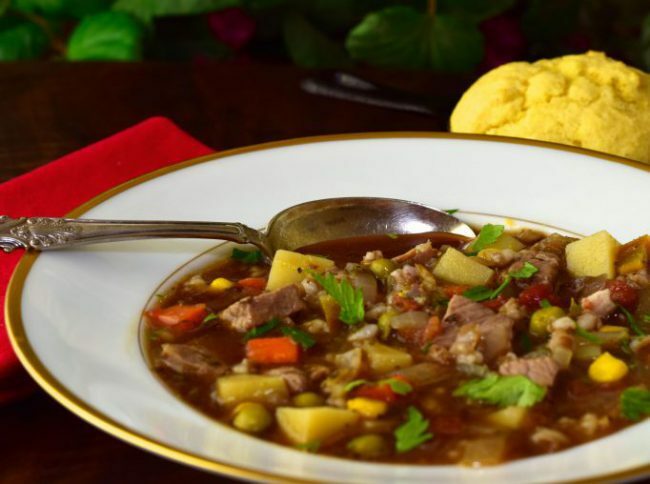 In the Dominican Republic if it gets 75º they are putting on their parkas, so I think even they would appreciate this warming delicious Beef Barley Vegetable Soup recipe next time they get into their “chilly” days. After two weeks of eating a lot of fresh fish, conch, baby eels and crab, BB and I were ready for some meat. So our first Sunday home I made a roast beef; simple roast in the oven with some garlic stuck into it. It was really good, but as always, there is a lot of leftover meat. A 3 1/2 pound roast goes a long way when there are just two of us. I do love a good Beef Dip sandwich, and my recipe for California Chile Roast Beef Sandwich is always a good use of leftover beef, but I wanted to make something more warming and different. 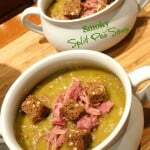 I often make soups from what I have around the house, and this soup is no different. Using leftover roast and a bit of gravy to make a rich broth, adding fresh veggies, some cooked pearl barley and a few simple herbs, turned this into a rich comforting soup. Add a can of consommé to the box of broth. 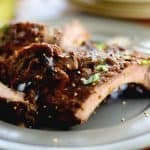 Simmer a meaty beef bone in with the broth for about an hour or until the bone has infused the broth with meaty flavor. Get a can of beef gravy and add it to the broth. Or, if you don’t mind a thinner broth, leave it be. To thicken the broth, once the vegetables have been sweated in a bit of oil, I add about 1/4 cup of flour to them and stir and cook that in. After that has been lightly browned, I add the stock. This makes for a nice rich broth. You can, of course, use whatever vegetables ring your bells, but I use carrot, celery, peas, corn, green beans (if I have them, I did not this time), potatoes, and of course, diced onion. Not being a big fan of frozen carrots (they just aren’t the right texture), I always use fresh. Peas and corn? Frozen is fine. Green beans? I only use fresh. 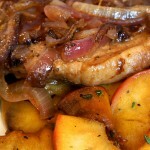 The same goes for the potatoes and onions – fresh. Barley is a member of the grass family so yes, it does contain 5-8% gluten. Therefore if you are gluten intolerant, you might want to choose a different grain, Quinoa would be a good choice. Barely is low on the glycemic scale, making it a good wholesome grain that also helps keep blood sugars in check. Barley is a nutritional powerhouse – packed with fiber, important vitamins and minerals while being slim in fat and cholesterol free. Barley beats Quinoa and brown rice as being rich in both soluble and non-soluble fiber with a whopping 3 grams over Quinoa’s 2.6 and brown rice’s 1.75. And we all need more fiber in our diets! I always pre-cook my barley as it is very starchy and while I want the fiber in my soup, I don’t want the additional starch. I cook my barley the same way as I cook my pasta and rice, in a large pot of boiling salted water. Once the water comes to a boil I add the barley and cook, stirring occasionally, for about 50 minutes (for standard pearl barley) or until it is just al dente. Drain into a colander, rinse well, and add however much you want to your soup. For my soup, I cooked 1/2 cup barley which yielded about 1 1/2 cups cooked. If you think about it in the morning and don’t want to spend 50 minutes cooking the barley, put it in a bowl and cover it with water in the morning, drain and cook it with the same method. Pre-soaked it will only take about 15 minutes to be done. LindySez: We served the soup with some homemade Polenta Corn muffins; the perfect addition.